But lately, I’ve come to wonder if my apathy about the Union just might be misplaced. Because when you look closely, you start to see that the team possesses all the hallmarks that define our city’s sports dysfunction. In just six years of the Union’s existence, it seems the Ghosts of Philly Sports Past have been summoned to haunt the upstart franchise. Which means that the most Philly team in Philadelphia right now just might be the Union. 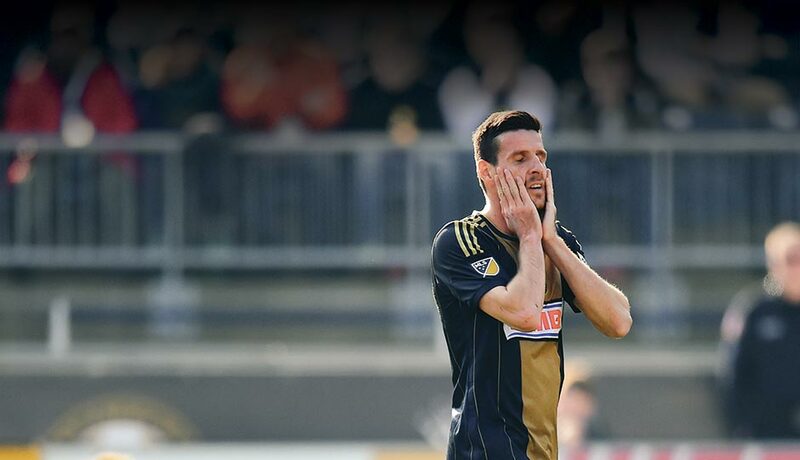 As quickly as optimism arrived for the new franchise, the Union’s decline began, in ways that are straight out of some unwritten Philly front-office playbook. Fans have seen a rotating cast of coaches (three in just six seasons) that makes the Flyers look patient by comparison; questionable draft picks (similar to Eagles first rounders Marcus Smith, who recorded zero solo tackles in his first season, and Danny Watkins, who has returned to firefighting); and head-scratching roster moves, like the dismantling of what was one of the league’s best defenses in 2011 (sort of how the once-mighty Phillies gloves are now among baseball’s most error-prone). Making Sak’s job tougher is the fact that he’s the face of an ownership group recalling the late-’90s-through-mid-2000s Phillies: mysterious, unaccountable, and tight with the purse strings. The Union’s stadium, PPL Park, broke ground in December 2008, just as the nation’s economy was crumbling. As a result, all the feel-good projects surrounding the stadium never materialized. It’s also presumed principal team owner Jay Sugarman — whose business, iStar Financial, is tied to commercial real estate — can’t invest as much in the team as he would have if the recession hadn’t happened. To be fair, much of what you hear about Sugarman is speculation, given his Sam Hinkie-esque aversion to recording devices; he’s spoken to the media exactly once in the team’s history. In that lone press conference last year, Sugarman talked about the need to groom young talent “as the long-term way to keep the Union competitive against teams that, you know, possibly will have greater resources than we will.” That’s a strange thing to say about a pro sports team in the fourth-largest television market in the country. But it also sounds familiar, suggesting that Sugarman and Sak are running the Union like a “small-market team,” as former Phillies president Bill Giles once dubbed his ball club. Luckily for the Union’s brass, its fans are still showing up — understandable, given that they haven’t suffered for decades. But they’re catching up. A team in desperate need of a stud goaltender churns through a long list of net-minders. When ownership finally decides to pay top dollar for the best backstop available, he flops and is run out of town. This scenario sums up the Flyers, with their revolving door of goalies and the signing of Ilya Bryzgalov, who became best known for allowing soft goals and his Borat-meets-Stephen Hawking musings on the universe. It also describes the Union and its goalie saga, which is somehow even more of a soap opera. The guy in goal is just one of many problems the Union face, especially this season. Imagine if the Phillies lost six starters from their lineup at once. (Maybe that wouldn’t make much of a difference this year, but humor me.) At times the Union sideline has looked like a grassy triage — a forward with a fractured cheek and a concussion (plus, later, a bonus DUI), a midfielder with a bum ankle, and, in one practice alone, two goaltenders who hurt themselves. It’s a collection of walking wounded that Chip Kelly would appreciate, or for that matter Sam Hinkie, with his soft spot for drafting players who need a year’s worth of rehab. But unlike the Sixers, tanking is not an option. The Union need to win now. Then there’s the time-honored tradition of underperformance. Freddy Adu was a child prodigy — at 14, he became the youngest pro athlete in any American sport, and was hailed as the next Pelé. Adu’s arrival in Philly at age 22 wasn’t exactly a game-changer, the way Andrew Bynum joining the Sixers could have been. But like our least-favorite ex-center/amateur bowler, Adu had a marquee profile and David Beckham-like potential. As any cynical Philly sports fan would expect (see also: Nnamdi Asomugha, Dominique Rodgers-Cromartie, Vinny Lecavalier), Adu’s star fizzled here. “The Union’s big-ticket items have not worked out,” says the Inquirer’s Marc Narducci, who could say the same of those of all the other local teams. Nothing defines a true Philly team more than the dreaded letdown, and the Union have mastered the art of the last-second disappointment. Of the nine games they’ve lost by a goal or tied at press time this season, five slipped away in the closing minutes. That tradition dates back to the historic collapse of the 1964 Phillies — who lost 10 of their last 12 games and missed what seemed like a guaranteed World Series appearance — and continued through 2014, when the Eagles missed the playoffs in the second-to-last week of the season. Asked which letdown game hurt the most, Sons of Ben member Fiorito sighs: “They’re all so bad, they’re blurring together.” If the city ever erects a sign welcoming fans to the South Philly sports complex, that should appear as our motto. For now, attendance is still strong; home games average 17,500 fans, just a thousand shy of capacity (and not much less than some Phillies games are drawing). In their willingness to suffer through tough times, the Union faithful have proven more like boosters of the Eagles and Flyers than of the Sixers or Phillies. But when diehards who wear “SoB Til I Die” scarves are choosing to watch from their sofas, it’s time for some soul-searching in Chester. One Sons of Ben member asked where they could get a thousand paper bags to wear on their heads at the next home game. He was only half joking. Hours after the SoBs’ funeral march into the stadium, their squad provided a rare glimpse of hope for the future. The Union was trying to avoid a record-setting five-game losing streak against a D.C. team that had won eight in a row, and in the waning moments of a scoreless contest, fans braced for another late letdown. In stoppage time, a miracle was delivered — a crisp crossing pass, and a decisive shot (by a kid from Upper Dublin High!) past the sprawling D.C. goalie to give the Union a win. It was only the second victory of the season, and as smokebombs and delirium spread in Chester, it was easy to forget that the Union is a team from Philly, where disappointment is never far away. Originally published as “Union Trouble” in the July 2015 issue of Philadelphia magazine.